Typically the end of the Holiday season and New Years signal the advent of Spring, so putting your home on the market around the time of the Spring Equinox might be the perfect option for you. Markets vary, so only your local professional real estate agent can advise you on what is best in your area, but there are some reasons you might want to put your home on the market BEFORE the first day of Spring. While some analysts tout Spring as the best time of year to sell a house, these same analysts advise buyers to make an offer on homes in January and February. With lower inventories available, homebuyers looking for a deal in the cold of winter may find what they are looking for in your home. Those with early tax refund checks may be ready sooner than others to snap up a good deal. Homebuyers care about finding the right home in the right place for the right price at the right time for them. According to a National Association of Homebuilders (NAHB) study, homebuyers want energy efficient appliances, windows and other features that permanently lower utility bills; extra storage and organizational features that include a laundry room, linen closet in the bathroom, a walk-in pantry and extra storage space in the garage. To sell your home in midwinter, consider staging that takes weather into account. Make sure the walks and entryways are free of snow and debris. Take the time to clear off the patio too. You may not use it in winter, but your buyer needs to know it is there for the summer. 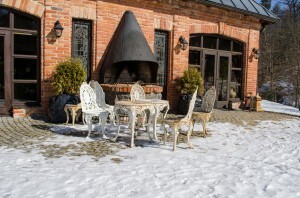 Winter patio use is gaining popularity too! If you have a gas fireplace, light it. Consider placing a grouping of candles in a wood fireplace and lighting them while the house shows. (NOTE: some buyers may be allergic to smoke from wood-burning fires, so consider not a lighting wood fire unless it is integral to heating your home). Since daylight is at a premium in winter, try to have your house shown during daylight hours. Make sure your windows are clear and free of winter grime and window treatments are clean and dust-free. If your house must show after dark, make sure to turn on every light in the house and yard so that your home is warm and inviting.